Kavieng (150.793E 2.58S), located at the northwestern tip of New Ireland in the Bismarcks, had a protected anchorage that might have played an important role in the war if it had not been overshadowed by the great fortress at nearby Rabaul. The anchorage is handicapped by strong tidal currents and numerous shoals. Nonetheless, the Japanese occasionally used it as an alternate anchorage to Rabaul. At the outbreak of war, the facilities were barely adequate to load copra from nearby coconut plantations. However, New Ireland had the only all-weather road of any length in the Bismarcks, which ran along the entire northeast coast of the island and had a spur to a ferry landing on the southwest coast of the island across from Rabaul. The anchorage was discovered by the Dutch in 1516, but the first permanent white residents, German missionaries, did not arrive until 1877. The Germans established coconut plantations that made the colony one of the more profitable in the German Pacific empire. The region was seized by the British during the First World War and turned over to Australia. Elements of 2 Maizuru SNLF (500 men) occupied Kavieng on 23 January 1942. The Australian garrison, which had just completed an airstrip, cratered its runway and retreated into the interior of New Ireland. The Japanese garrison was later reinforced with 14 Base Force and elements of 5 Kure SNLF and 5 Sasebo SNLF. The Japanese attempted to reinforce the garrison in December 1943, using battleship Yamato as a giant troop ship, but Skate scored a torpedo hit on Yamato on 25 December 1943 that did serious enough damage to force cancellation of the reinforcement attempt. Kavieng was hit hard from the air the same day. 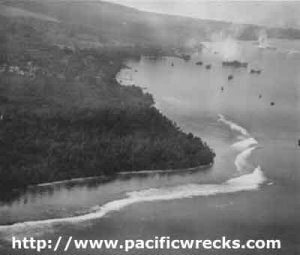 Sherman's Task Group 50.2 raided the island with 86 aircraft and found the anchorage almost deserted. A weak counterattack that night by 4 G4M "Bettys" and 7 B5N "Kates" failed to score any damage. There were further raids in the next few weeks, including one on 1 January 1944 against a convoy returning from Rabaul to Truk that did little damage but drew off Japanese air strength during the Saidor landings. Plans to carry out an amphibious landing against Kavieng were canceled on 12 March 1944. Kavieng was then bypassed by the Allied counteroffensive.